Brad Stevens does not believe there was anything wrong with the Boston Celtics holding a team meeting on Friday. Boston's losing streak in the NBA was extended to three when they fell to the Milwaukee Bucks 120-107 at home. After the game, the slumping Celtics (18-13) had a lengthy discussion in its locker room where star Kyrie Irving said "selfish play" was addressed. The conversation continued for 90 minutes the day after the loss, Stevens told reporters on Sunday. But, the Celtics head coach said he expects the "transparent talk" to help the team moving forward. 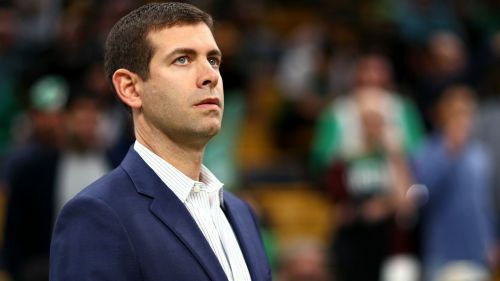 "Every day we have closed-door meetings," Stevens said, via The Athletic. "But some are obviously more impactful, more transparent and a little bit more raw than others. And I think those are probably the most memorable, enjoyable and purposeful times when you reflect on the season." Stevens added: "Ultimately if you're on a team with 15 people that have good intentions and are willing to share what they're thinking, what they're seeing, what they're feeling, that's a pretty good place to start."